Rafael Nadal overcame illness to avoid a shock defeat in the 2nd round of the Australian Open, winning American Tim Smyczek in a dramatic 5 set thriller Wednesday on the Rod Laver Arena. 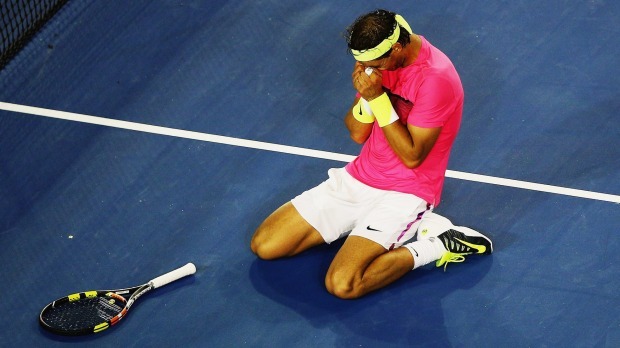 Nadal, who has never lost to a qualifier in a grand slam, looked on course to suffer that fate at the hands of Smyczek. The 28-year-old Nadal sought treatment from the tournament doctor early in the 3rd set and looked physically drained as he failed to serve out the set at 5-4. Given the suffering, the Spaniard still pushed through to claim victory 6-2 3-6 6-7(2) 6-3 7-5. “I don’t know what was going on,” Nadal said in a courtside interview. “I started to have cramps in different places. I was not in the perfect shape.” Visibly struggling to stay afloat, Rafael Nadal has shown again the substance great fighters are made of.